To run the configured main class for your project, you may use the :Java command, which executes java and displays the results in a temporary buffer. Please note that this command is not intended to be a full replacement for the more advance support provided by eclipse, ant, or maven. if the first argument is ‘%’ (:Java %) then run the current class. if the setting org.eclim.java.run.mainclass is set, then use the value as the fully qualified class name to run. lastly, attempt to locate a class containing a static main method, if only one is found, use that class. org.eclim.java.run.mainclass - Fully qualified name of the class containing the main method. org.eclim.java.run.jvmargs - Json formatted list of default jvm args. 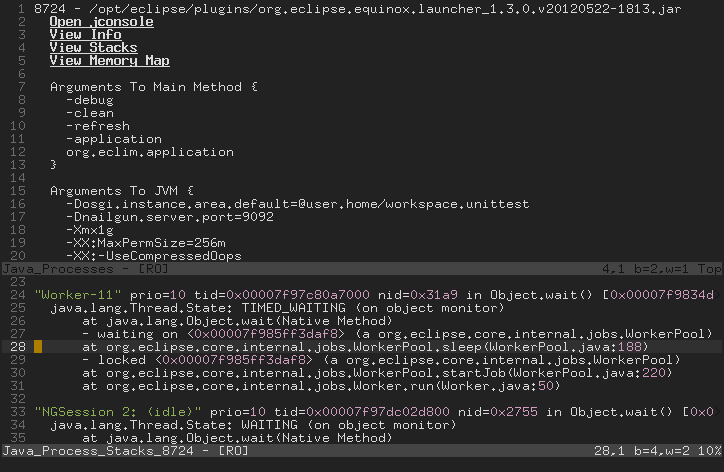 To view a list of all the JDKs/JREs that eclipse is aware of, eclim provides the command :JavaListInstalls. As of Java 1.5 (Java 5.0), the sun jdk started shipping with some useful tools for viewing information about running java processes. To provide quick and easy access to some of the information these commands provide, eclim exposes the command :Jps. For more information on the jdk tools you may view the online documentation. When invoked it will open a window containing information about the current processes and some links for viewing additional info (depending upon availability of required tools on your platform). Line 1 consists of the process id followed by either the class name the process was started with or the path to the jar file. Lines 2 - 5 contains links that when you hit <enter> on, will open another window displaying the requested additional info. Lines 7 - 13 is a foldable block which contains a list of all the arguments passed to the main method of the process. Lines 15 - 21 is a foldable block which contains a list of all the arguments passed to the JVM.